...and that was putting it mildly. Don't judge me too harshly, but I'm a sucker for "Notting Hill," and my favorite part (aside from the press conference scene at the end) is when the delightful Hugh Grant is attempting to shimmy over a gate and failing miserably. "Whoopsidaisies!" he says. It gets me every time. Yes, this bread can only be classified as a big ol' "Whoopsidaisies!" Lesson learned: Don't use baking powder that's over three years old, and if you stubbornly insist on doing so, at least make sure you sift it. Other mistakes: I didn't bake the bread long enough and shouldn't have spread the batter out into six mini loaves--the end result was more like a batch of way-too-moist and sticky rectangular hockey pucks. I should've known that I was in for trouble when I had to dig my baking powder out with a knife. I foolishly soldiered on, though, not even pausing to break up the chipped-off clumps of the stuff. The result was the green, vomit-like growths you see above. 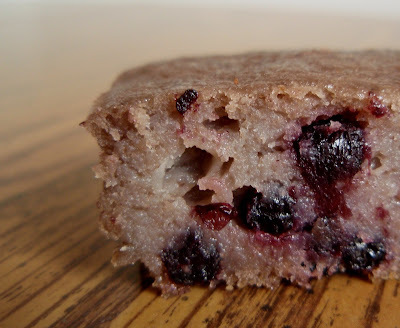 They were scattered throughout my loaves, which had such potential--they were flavored with apple-blueberry baby food and speckled with dried blueberries. Preheat the oven to 350F. Generously grease or spray a 9x5-inch loaf pan. Sift the flour, sugar, baking powder, baking soda, salt, and cinnamon into a small bowl. In a larger bowl, whisk together the egg, vanilla, vegetable oil, apple-blueberry baby food, and starter. Add this wet mixture to the dry ingredients and stir just until moistened. Fold in the dried blueberries and pour the batter into the prepared pan. Bake for 50 to 60 minutes, covering the loaf with foil during the last 10 minutes if necessary to prevent overbrowning. The bread is done when a toothpick inserted into the center comes out clean. And it had such potential... I'm sorry... I do like the cinnamon-blueberry combo, though! I hate it when things don't work out. It sounds fabulous though! Dont you hate when ingredients are wasted.. happens to me all the time. It really sounded like marvelous flavors. Im still singing the Barney song in my head from your last post. It comes as a disappointment Grace when a bake doesn’t turn out as expected - I am sorry! The flavours sounded really good. The concept sure sounds good anyways! Aww, I'll be sure to remember that about the baking powder, I had no idea! I do remember that part in the movie! I had my own little failure last night, but it didn't come out looking this good :P! Too bad, but it's great you kept a sense of humor about it! The recipe sounds delicious, and I could actually try this now that I (finally) have some starter! I know it's wrong but I'm glad to read that things don't go well for others, too often it feels like it's just me! :-) 'Cause it's rare that something doesn't go wrong! Thanks for sharing! i love notting hill, too! spike never fails to crack me up! barack dough-bama?!?! I LOVE IT! Even though it didn't turn out as it was suppose to, kuddos to you for still posting. We all have mishaps. Let me go check my baking powder! (3) you're practically giving a shoutout to everyone of us guilty of having expired ingredients in our pantry! Oh well. You win more than you lose. As the saying goes "keep on trucking"! Whenever I think of Notting Hill, I picture Hugh Grant saying, "Beevis and Butthead" to the hotel clerk! HA! Sorry these didn't turn out; the addition of baby food was genius! Now I'm off to check the expiration date of all things baking related in my cupboard! Aw shucks! Lord knows I've been in this type of situation before! Perfect timing. I just bought a can of new baking powder! Ew that green stuff looks like mold. I have used dead yeast before- not pretty. I mess up alot in the kitchen and I should start kitchen blooper posts so that we can all laugh at the stupid things I do. I love Notting Hill, too. I've been known to sneak a jar of baby food into breads; it's really a great treat. I recently made a batch of banana bread and just plain forgot to put in the baking powder. Talk about a "brain fart" that makes you feel like a real idiot! I use the phrase all the time but never attributed it to Notting Hill. I learn something new every day!! aww that's definitely happened to me and this is a great wake up call to check for expired stuff in the pantry. i can't imagine you with an expired can of baking powder! quite shocking. A lady I took a cooking class from once called these misses because normally nothing fails because you can still eat it but its just not as pretty. But the flavor combo looks fantastic, I would give it another shot! LOVE your brothers starter name. Too funny! I like Notting Hill too. I am a sap for romance. I watch, Sleepless In Seattle, An Affair to Remember, Return To Me (my fav) and You've Got Mail quite often. Such a sap I know. Oopsidaisies has transformed itself in our house to "oopey-do-do's". The kids love to say it! I finally printed out a sour dough recipe. Soon I hope to "start" it! I adore Hugh Grant, I don't like Julia Roberts-hate me if you will. But I adore Four Weddings and a Funeral too. Any Brit movie I adore. Sorry the bread didn't work out, can we make pancakes with it? Oh no, sorry about your bread. Parts of it look really good. The green area definitely looks vomit worthy! Well, I learn from my own mistakes too :) The recipe sounds great though. But thanks for sharing the experience, because you taught me some things! I had a major fail this week too - I hate wasting ingredients like that! And, I love Notting Hill...the movie, the soundtrack. Love it all! That's too bad. It sounds like it would be really delicious. I love Notting Hill, great flick! I love his flat mate..and his sister, too funny!! Anyways, we all have mess ups!! I hate when that happens. At least you have a positive attitude! I'm surprised you have bad baking powder with all the baking you do! FOr as much baking as you seem to do what a shock to find out your powder is so old...LOL, it happens to all of us one time or another, but you are the bigger person to own up to it. Sorry it didn't turn out cause I bet it would have been fabulous. Doughbama is a very excellent name! Why on earth did the baking powder make your bread go green though? Oh, Grace, how disappointing! It's so frustrating to put time into a project and have it not turn out the way you want. 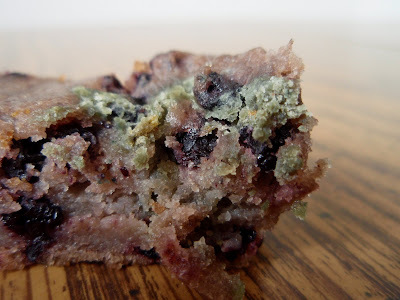 I have seen that same greenish, grayish discoloration going on with other blueberry baked goods, however, so it may not have been all due to the baking powder. It's one of my favorite movies...I love Hugh and Julia. I bet this recipe is terrific if you use fresh baking powder. I'll be checking the date on mine. Thanks for the baking-powder tip (I'm sure mine is old), for stopping by again and for sharing about Notting Hill. I love anything with Julia Roberts in a romantic comedy--my favorite movie is Pretty Girl, and I can recite the script by heart! You realize I'll be saying "Whoopsidaisies" for weeks! I've had my share of whoopsiedaisies. I feel your pain!!! Really, old baking powder doesn't work? What about the rock-solid soad in my fridge LOL. Yummy-looking as always, Grace! I love that movie, his roommate is my favorite. We've all been there with the ingredients. Should I or shouldn't I use that? Oh well, next time! Haha, what an hysterical occurrence...totally worthy of a Notting Hill reference! I must admit, apart from the green parts, your gooey bread looked quite appetizing to me. I guess that says something about how I like my baked goods. I can't wait to try this recipe; it looks like a great one! What a great post! We've all had things turn out this way. The recipe really does sound yummy. Maybe if the Toronto Maple Leafs had pucks like this they might be able to score more often :) - and if it doesn't get to the net, they can eat them. Oh nooo! Well, it happens to all of us. Sounds tasty, though. Couldn't have guessed things didn't work out from the photo, still looks good to me :). Look at it this way, you'll have an excuse to try am make some more soon. My father is a huge fan of sourdough blueberry bread and I always try to bake one for him whenever we see my parents. He has yet to be fully blown away by any of the recipes i've tried. Simplicity is key, and yours looks perfect! Can't wait to try it. thank you for shearing your post.